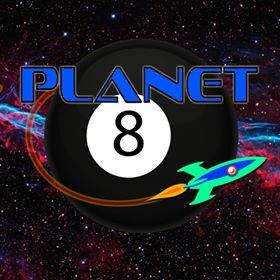 Doug: A couple of weeks ago Karen queried why we hadn't done a "Favorites" post in quite some time. No good answer, then or now. So hey -- let's do one! 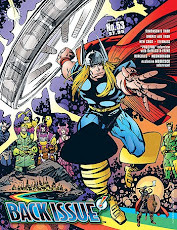 Today's review is of a comic that was among my first few Avengers -- the copy I originally had was without a back cover and was a little dinged up throughout. 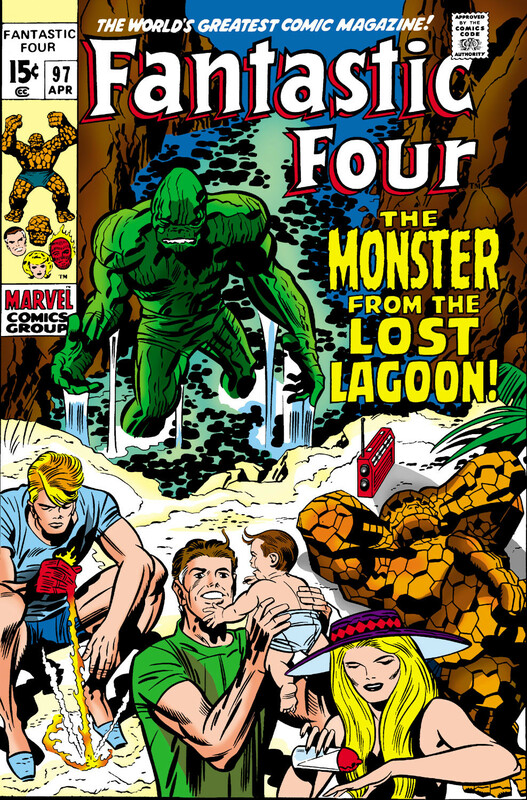 However, its significance was immeasurable -- this was my introduction to the Silver Age art of John Buscema, who would have been seen by me in Avengers #152 and the Fantastic Four (during the Galactus/High Evolutionary arc) at approximately the same time as my acquisition of this book. I'm not sure where I got it, and have since replaced the beat-up copy (today's cover image is a scan of the cover of my copy). I feel this is a really strong done-in-one (OK, admittedly it does segue into Avengers Annual #2, but reading that book is not essential in my estimation for enjoying this issue) -- wonderful art, characterization, and certainly sentimental. What a great launching pad for my true appreciation of Big John Buscema. 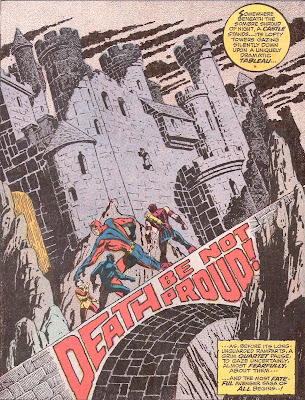 Doug: We open with a great splash of the drastically pared down roster of Goliath and the Wasp, Hawkeye, and the Black Panther on a bridge with Castle Doom looming in the background. The use of the bridge to frame the story's title is just an excellent visual. 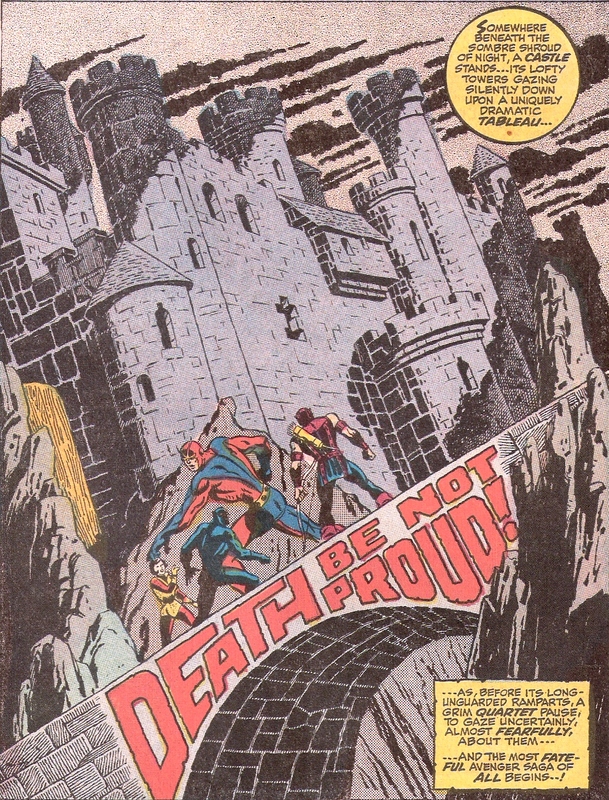 And like all things Buscema, there is endless dynamism among our four heroes, despite the fact they've paused before entering the castle. They've come to Latveria to answer a distress signal, allegedly from Captain America. Cap had been absent from the roster for a few issues, so there was some doubt on the part of the team as to what exactly they were getting into. 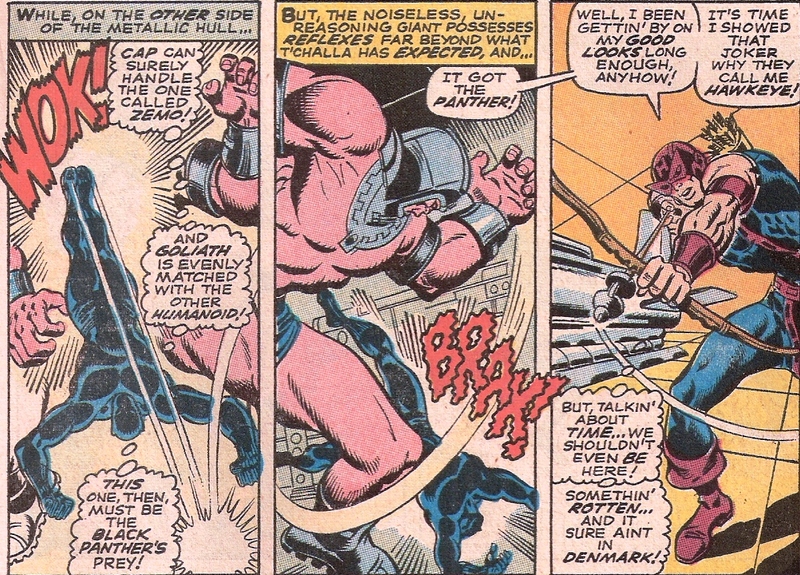 Goliath decides it would be best to avoid the front door, so hoists T'Challa in a maneuver that we Bronze Age Babies know only as a "fastball special". Once on the ramparts, T'Challa steals inside and lowers the massive drawbridge. Once inside, Goliath shrinks back to his normal 10-foot height and the team begins to progress. 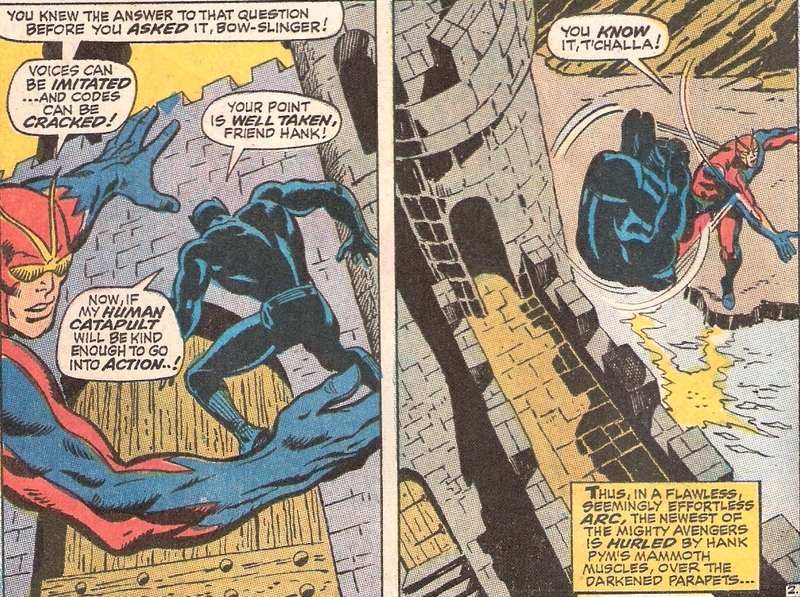 However, before they can even take a step, T'Challa warns Goliath to freeze -- and then a mine goes off. As the Panther was brand new to the team, this story served as a bit of a transitional time for him -- he had to prove his worth to everyone, notably Hawkeye. 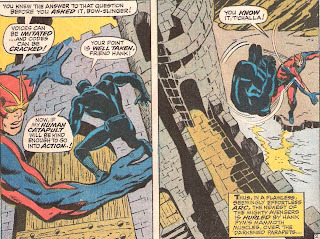 Doug: Now into the inner chambers of the castle, the team is led into the dark by T'Challa. He hears a rustling behind a drape ahead, and attacks. To everyone's surprise, the Panther comes flying right back past his teammates! Goliath moves menacingly toward the now fallen drape, but is stopped from pummeling it by a familiar voice -- that of Captain America! Cap tells that he issued the call for assistance to come to Castle Doom because he had recently found out about a time machine once used by Doctor Doom in an adventure with the Fantastic Four. Cap became convinced that he could use it to return to that fateful day in 1945 when he and his partner, Bucky Barnes, faced off against Baron Zemo... the day that Bucky died. But did he? Cap recalled the explosion of the drone, and of being tossed far away from it. But what of Bucky? If Cap survived in the ice for almost 20 years, why couldn't Bucky? And yes, this story is canon as far as I'm concerned -- that recent stuff? Not on this guy's radar. Doug: The team relocates to the room that houses the time platform. Between Hank's inspection and Cap's conversation with Reed Richards just days earlier, they figure out how to operate the device. The Wasp is instructed to stay behind and operate the time machine, with the warning that she must sequence a series of buttons, at regular intervals --this issue features one of the most sexist portrayals of Jan that we've seen since the days of Tales to Astonish. Sheesh -- she couldn't even rate a spot among the cover's floating heads! And then something curious happens -- the team stands on the platform and is sent to the past. However, a) the platform does not ascend through their bodies as we usually see it, and b) when they emerge in 1945 England they are wraiths. If this was truly the second appearance of the time platform (the first having been in Fantastic Four #5), there's a piece missing, as the FF had materialized in solid form in Blackbeard's time. Anyone with insight on this dilemma is encouraged to bring me to a state of enlightenment. Doug: Once in the past, the team has landed right at the center of controversy. They spy Baron Zemo entering a hangar used by the Americans and carrying some sort of lockbox. Zemo remarks that he feels as if he is being watched, a funny feeling on which he'll remark a few more times throughout the story. The Avengers phase right through the wall (shades of what's coming in the very next issue, hmm?) and see Zemo fire a gun of some kind into the now-opened box. Suddenly a giant (and an ugly one at that) emerges, almost zombie-like. The Avengers marvel at this event, and watch Zemo's next move. But before the Nazi can do anything, who should burst through a window but Captain America and Bucky?! Fearless as always, Cap launches himself right into the giant android, while Bucky rolls Zemo. Zemo commands the monster to kill his adversaries, and our heroes don't fade from the challenge. But the onslaught gives the Baron time to reappropriate his weapon, and turn it on Cap. 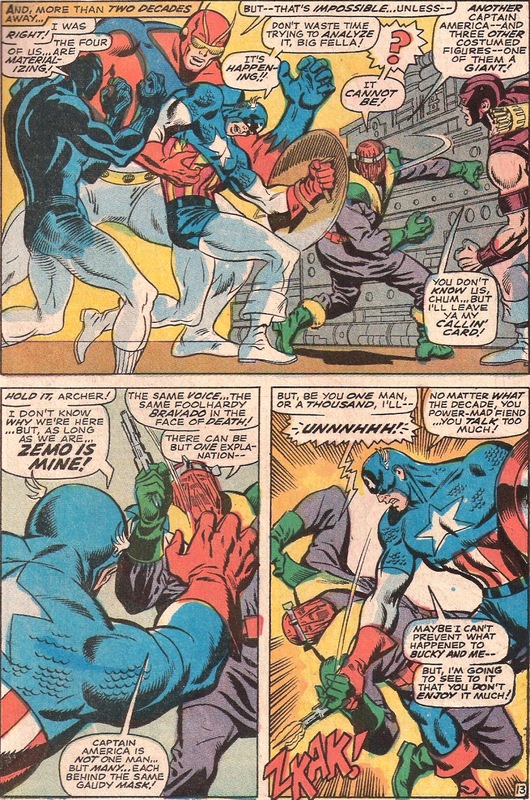 However, Cap's shield gives Zemo his second trip onto his backside. Bucky decides to tackle the giant alone -- bad call. Shrugged off and dazed, Cap rushes to his partner's side. 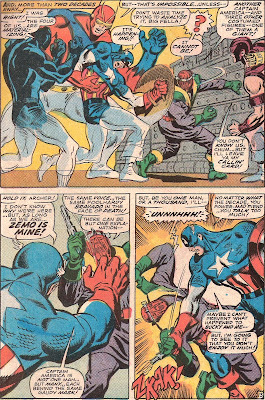 This gives Zemo the opportunity to knock the Star-Spangled not-yet-Avenger out. Doug: Zemo now holds all of the cards, and his plan to steal the drone from the Americans appears to reach imminent fruition. Cap and Bucky's costumes are removed and replaced with GI uniforms. Zemo's logic is that 1) he hates their garish patriotic look, 2) Captain America was responsible for the incident that grafted Zemo's mask to his face, and 3) with the plan to program the drone to fly right into Berlin and land in front of the Fuehrer, America's greatest heroes will arrive unmasked and as defeated adversaries, strapped to the object of Zemo's thievery. However, and you know this -- "as fate would have it" -- the Wasp suddenly becomes smitten with drowsiness and a finger falls onto the wrong button. Unexpectedly, the Avengers materialize right in the hangar, 1945! Doug: Cap wastes no time in moving toward Zemo. He grips his wrist, hard, and jerks the gun down. But before it can be totally removed from Zemo's grasp, a ray is fired again into the mysterious metal box... and another giant android emerges! And what's going on outside the hangar, you might ask? Uncle Sam's boys mobilize, and they want to know what all the commotion's about near the top secret drone. As they head toward that building, one of the giants comes flying through the wall, followed closely by Goliath. The boys in Army green are about beside themselves. Hank tells them to cool it -- he can't explain, and they wouldn't get it anyway. 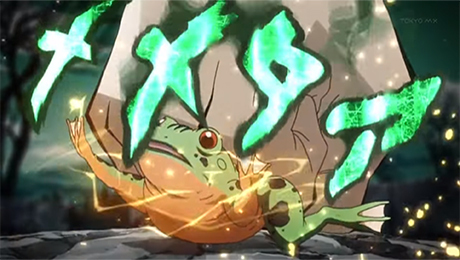 But while he's dealing with that, the android recovers and attacks. Back inside, the Panther takes on the giant's twin -- sort of. And what of Hawkeye? He launches a blast arrow into the face of the android -- to no avail. But who needs trick arrows when Captain America is around? Ever the champion, Cap attacks the giant from behind, bending it backwards. 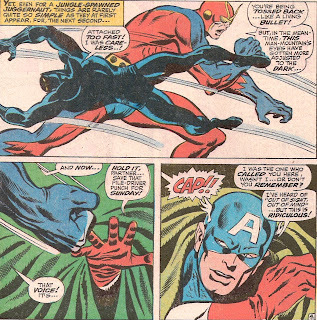 T'Challa offers his best punch, and cracks the control panel in the android's chest. Almost simultaneously, Goliath makes the same discovery and knocks the second giant out of action. Of course, the soldiers want answers, and Goliath tries to hold them off -- but suddenly he begins to phase out! Doug: Back inside the hangar, Cap also begins to phase out. Knowing he won't get another chance to defeat Zemo in this context, and throwing all caution and common sense to the wind, Cap whips his shield at his historical self. The mighty disc slashes the ropes holding the WWII Cap and Bucky to the drone. Not to lose out at this point in the game, Zemo lunges for the control panel, starting the flight sequence for the drone. 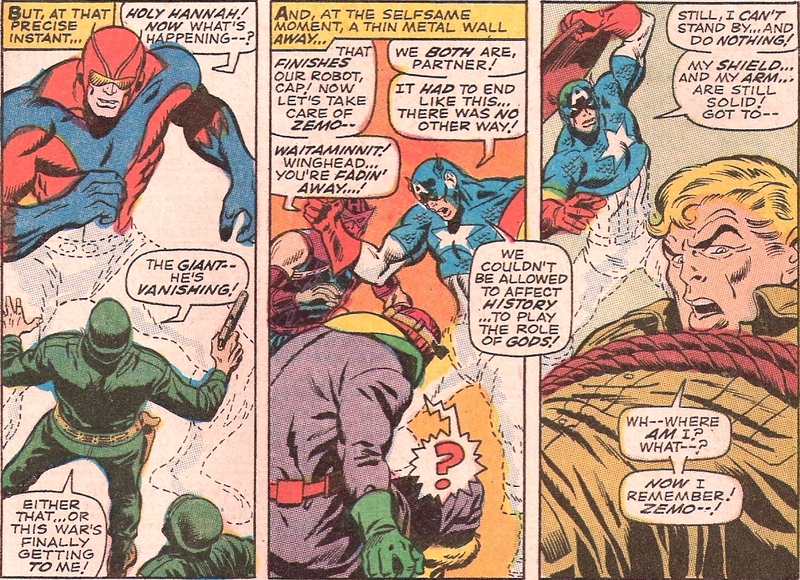 Cap and Bucky divert their attention from their Nazi assailant and turn instead toward stopping the drone's take-off. 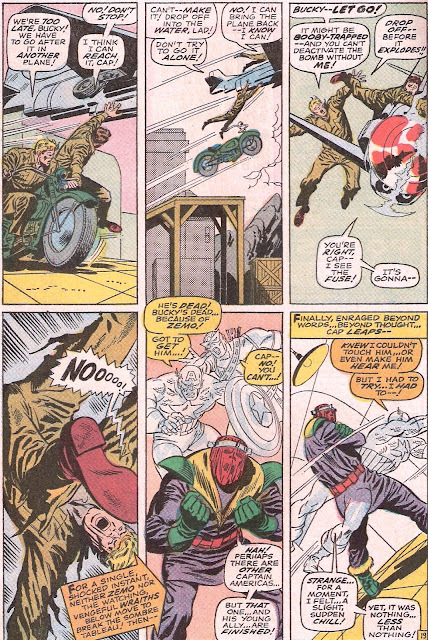 Commandeering a nearby motorcycle, Cap and Bucky race after the plane and get close enough that they are able to launch themselves off a ramp and onto the plane. As Bucky latches on and begins to climb toward the cone, Cap begins to fall away, yelling at his young partner to also let go -- the thing could have been booby-trapped by Zemo! Bucky notices a fuse, but it's too late -- the drone explodes. Cap is thrown away from it, and as we know into the sea. Bucky? Our Captain America is sure -- Bucky died in the blast. In the hangar, the wraith of our Cap makes one last lurch toward Zemo, causing the criminal to shudder. Doug: Our story concludes with the 1940's GI's looking at the fallen androids in disbelief, and Zemo firing his gun at the giants from a distance -- vaporizing them. In the confusion, the Nazi was able to escape in a V2 rocket, and no one would know of the murder he'd just committed. Back in Castle Latveria, the Wasp welcomes the boys back. The mood is solemn, however, and Cap is allowed to move away from the group to be with his thoughts. As Cap goes forward, he'll always mourn the loss of Bucky Barnes. Yet in time, he'll welcome new partners, like Rick Jones, and the Falcon! 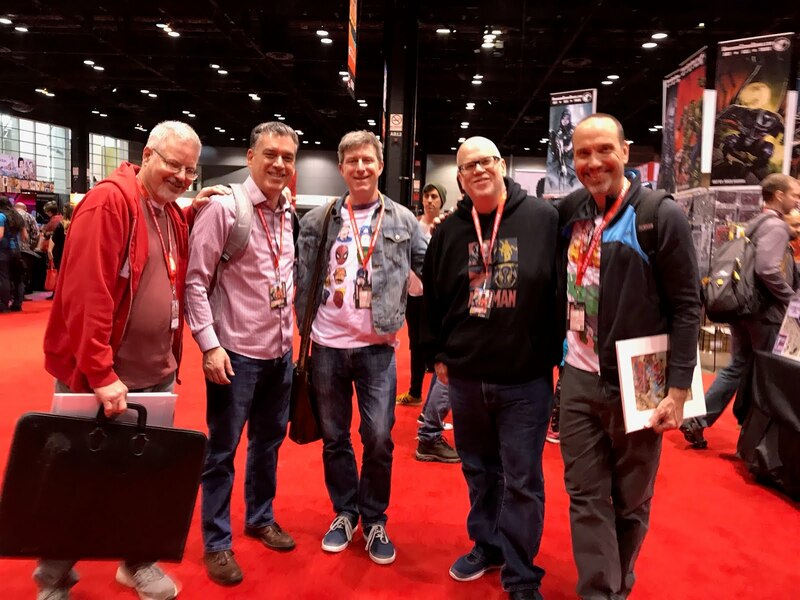 Doug: If there's one thing you get from Roy Thomas-scribed comics, it's a better vocabulary! Everyone knows he was an English teacher from Missouri, and his love of literature is well-known. 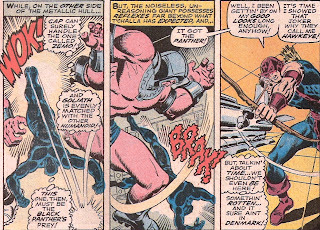 But how about Hank Pym using the term "Brobdingnagian" to describe Zemo's giant? It means, for those of you not in the know, marked by tremendous size. Whew...! Not a word I've added to everyday usage. But overall, even back in 1968 Roy's love of the Golden Age and of potential exploration of the era was coming to the fore. We'd of course see this over and over again, with the creation of the Invaders in Avengers #71 and other WWII-era heroes in the endgame to the Kree/Skrull War. And you know I'm going to gush on the art. Every panel in this book oozes action. The camera angles are varied, the anatomy and facial depictions are top-notch, and it just has the fingerprints of a master all over it. Some have remarked that John Buscema would reach his zenith when inked by Tom Palmer; I'd argue that George Klein is certainly doing no harm on these pages. The lines are light where appropriate, and firm when required. It's a slick production throughout, just beautiful. So it's a favorite for all of the above reasons, but mostly as a window for this young reader to WWII-era stories, a fun but limited line-up of heroes (boy, ol' Hawk did virtually nothing in this story), and of course the pretty pictures, my introduction to Buscema's Silver Age output. Twenty minutes perfectly spent, friends. There's a LOT to love about this issue. As hindsight, this indeed is the last pre-Vision Avengers story, and action-wise it not only satisfies but spins a pretty interesting retrospective tale, a great story by Mr. Thomas, probably at one of his early creative peaks. Fully agreed on Big John's art, arguably you could have had a wholly-better drawn Buscema Avengers presentation. Period. The few picks I have here are as follows..
One, must Janet once again serve the Sue Richards 'staying-back-to-operate-the-machine' role..? Sexist even for 1968, but I did like how her nodding-off was explained in that other issue so there was a saving grace there. Second, I didn't like the cover much. 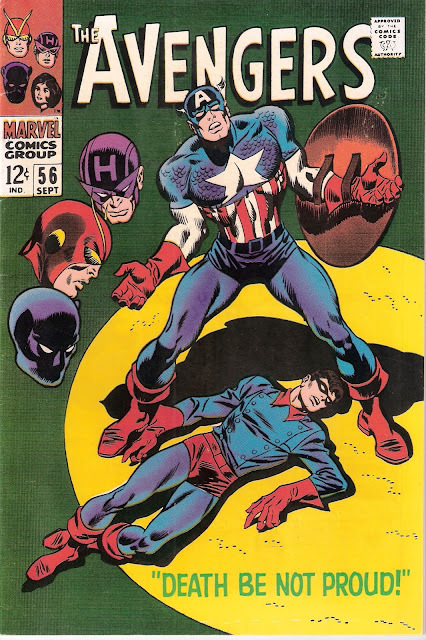 I didn't mind the mournful depiction of Cap, but his facial features (without the eyes drawn) was disappointing. Was the then-still-fresh RFK assassination in June '68 a subtle influence..? The pose of Bucky lying on the ground with the downcast eyes of the floating heads seems to suggest similarities to the Life magazine pics from the Ambassador Hotel in LA. Purely speculation here. All in all, it's been ranked as one of the Top 10 Memorable Avengers stories many times now, rightfully so. One of the features I most love about this particular comic is the open-ended ending. As written it stands alone effectively, so if you were one of the many who likely didn't see that years Avengers King-Size Special, you did not need to worry about living on the cliff for ages. But if like me you were one of those lucky stiffs, you got a smashing follow-up story which pitted the then current team against the original and one of the earliest iterations of an alternate universe in the broader Marvel scheme. It was in many ways too Don Heck's swan song for the team. 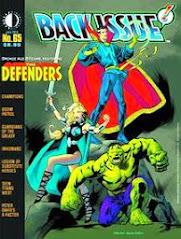 He'd return some years later for a few issues, but his spot on the Assemblers had been snatched by John Buscema when Heck was off drawing the first Annual and he never got back, at least regularly. Sigh! A great great comic! Doug, this is the Avengers at their most magnificent ! John Buscema was the ultimate Avengers artist. The modern incarnation can't hold a candle to this lot- and what are Wolverine and Spider Man doing in the Avengers anyway ? I will have re-read this as I have no memory of this at all. And they said Cap's Kooky Quartet was a low-powered lineup! One of the most iconic Avengers covers, imho. Great story and art overall, with a fine selection of members. But that splash page is breathtaking. I like Buscema fine, but I've never been a huge fan. However, that splash holds up with anything else the silver age has to offer. It kind of reminded me of Steranko's design sense. I wonder how much Klein had to do with the final outcome. When I was about 10 or 11, I found this teenager who lived by my grandmother's house. He had a complete collection of Marvel's starting from Fantastic Four #1 up into the early 70's. He used to let me borrow 10 a week (barring the really the stuff like FF #1 that he was probably saving to finance his college education). I was able to read my way through the entire Marvel history this way. THis issue stands out in my head as one of the ones I borrowed. Man, what was that guy thinking? Letting a 10 year old borrow his Marvels? It's probably lucky for me that I always returned everything just the way I got them. We're on the tail end of our vacation. We're staying in a house in Maine with...no wifi or coffee machine! I'm having to get my fixes at Starbuckles every morning. This is what I refer to as camping. Good write-up, good story. But is there anywhere else where Zemo's costume has the green bits? And I've said it before, but as far as I'm concerned, Bucky is STILL dead. Same goes for Sharon Carter, Mar-Vell & Norman Osbourn. Very nice review by my partner. This makes me want to go back and read this issue. The art is indeed gorgeous. I always liked Buscema inked by Klein, although I know Big John did not care for Klein ( or really anyone but brother Sal) on his pencils. Yes, Jan was portrayed in a terrible light, but really that was par for the course back then, and the main reason I never identified with or cared for any female characters as a kid. They all seemed like a bunch of incompetents. Although the Winter Soldier story by Ed Brubaker was welldoen, I do still wish they'd left Bucky dead. There's just something about that grief, that loss, that I think should have been left intact for Cap. I still question using it as the source material for the second Cap movie. 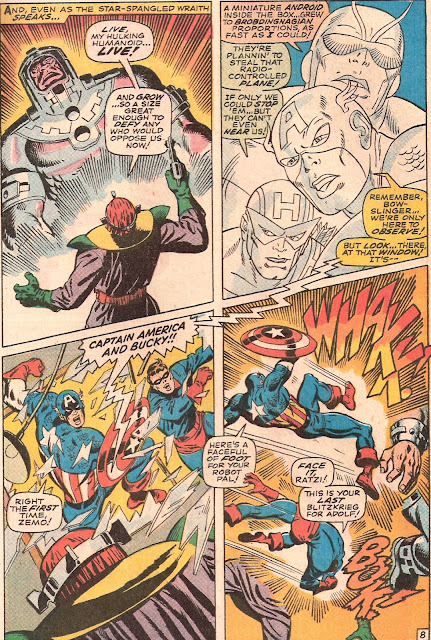 At least in the comics, we had 40 years of Cap dealing with the loss. In the film universe, it will be what -a year or two perhaps since they popped him out of the ice? not that much time to grieve and accept the whole thing. Sorry, meant to say in my initial post above, 'you could NOT have had a wholly-better drawn Buscema Avengers presentation'. Nice review, Doug. Sounds like a really good issue, and I agree with everyone else about the art. I regret never having read this; the Avengers reprints in Marvel Super Action, which I was reading regularly at around 1979/1980, skipped this one for some reason. Thanks, Edo, and everyone else for the affirmation! Today's was a review that basically wrote itself -- I loved the story and the art was truly worthy of all the praise we've heaped upon it. Preparing a post like today's is just a real joy, and such a good feeling for the investment of time. However, as Karen and I have remarked, there certainly are some clunkers along the way! Last night I wrote the framing portion of our upcoming review of Marvel Team-Up #10. It was trying on this man's patience! It wasn't a total loss -- shoot, Bronze Age Marvels rarely if ever are -- but I'll admit to slogging through it at times. So unlike when I wrote up Avengers #56 a few weeks ago! Great late Silver Age classic! And just like Thomas to take snippits of old Lee/KIrby mags and come up with some major elaborations on them. This issue is also representative of one of those periods in Avengers history since Cap first took an extended leave when Thor, Iron Man and Cap were not regulars on the team but would unexpectedly show up every so often and after this particular guest spot, the Big Three usually all turned up at the same time, as when determining whether or not to let the Vision join the team a couple of issues later or when they were mixed in with the upcoming Kang/Grandmaster games involving the first appearance of the Squadron Sinister (well, of course, had to have the Avengers big shots take on the ersatz big shots of the JLA!). Doug, it looks like you picked a real winner for your first look at Big John's art! Of course, this tale also seemed to have a real tear jerker in Cap's realization that Bucky was really and truly dead. Even after many years you could tell that Bucky's death still affected Cap. As for the Winter Soldier storyline, I do think it was a novel idea on Brubaker's part to resurrect Bucky as a brainwashed Soviet assassin although many purists would balk at the thought of bringing Bucky back in any form. Roy Thomas and Big John mesh well here; good story and good art - classic Avengers tale. Colin Jones, welcome to BAB. Yes, I agree with you - Wolverine and Spider-Man do NOT belong in the Avengers, no matter what configuration the team has. - Mike 'Avengers Assemble! Hmm when does Captain America: The Winter Soldier come out?' from Trinidad & Tobago. I'd like to know which Marvel Essentials volume this is in? I'd love to read the entire saga and would like to track this story down. I like the Essentials format because it is a much more economical way of reading these great works. I wish Marvel would take a lesson from it's past and have more stories like this. Instead of it's corporate driven event comics. I remember Chris Claremont saying in and interview that much more power is granted to the editor. The editor creates the plots and the writers have to run with the concept with much more interference. Fantastic Four Fan 4ever, it's reprinted in Essential Avengers Vol 3, which is jam-packed with classic tales and artwork. More thoughts -- just reviewing this issue, although Bucky's body isn't shown being torn apart by the bomb it doesn't seem credible that he would have survived. Of course, these are comics and characters have been shown blown to bits, atomized, etc., and somehow still came back later on. 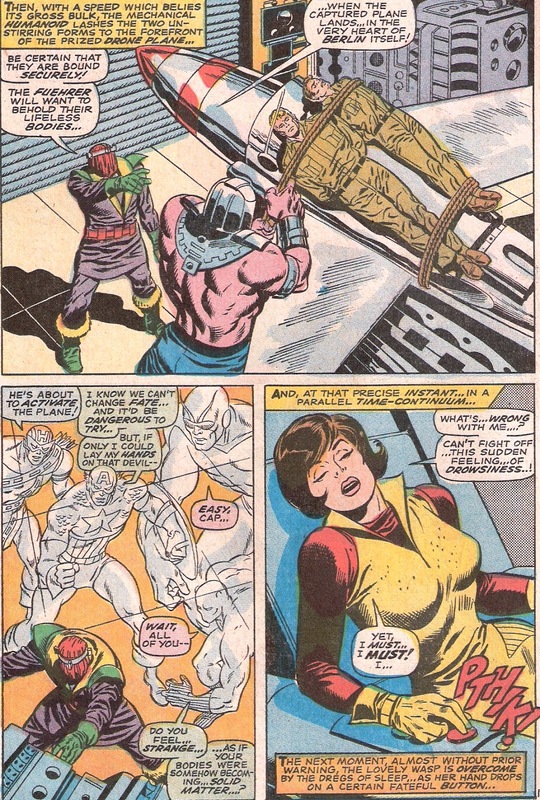 Of course, this was usually reserved for villains like Dr. Doom, Mandarin, Ultron and Loki, who in one of the funniest scenes in Simonson's run, had his head sliced off by Balder, and then just groped around, picked his head off the ground and put it back in place! But Bucky's death was intended to be permanent, like that of Uncle Ben, the Waynes, Battling Jack Murdock, or Gwen Stacy. It was the main tragic element in Cap's miraculous survival and return after 20 years under ice. It's my impression that as written by Lee & Thomas and others in the Silver & Bronze ages, Cap was a very different character than his Golden Age self, and similarly most of the comics characters we got to know in from circa 1961 to about 1985 are very different from those in the present era of the last 20 or so years, although they're all meant to be the very same characters. And if they're still around 50 years from now, they'll be different again although I seriously doubt I'll be around to take note. Am I being a nitpicker or have they got the colouring of Bucky's costume wrong for this issue? To the best of my Bronze Age knowledge, working mainly off of the Invaders and the Liberty Legion, I think Bucky's costume is colored consistent with that. As to the Golden Age, you can check out my review of Captain America Comics #5, which is also pretty much in-line with the art in Avengers #56. Actually, Doug, Steve has a point: Bucky usually has blue trunks, red leggings and blue boots. You know what part of my problem (read: excuse) is? I actually really prefer the color patterns in this issue to what you (Steve and Edo) have noted. And, checking the cover of Marvel Premiere #29, as well as the Marvel Legends figure in my comic room, I apologize because you guys are completely right! Thanks for setting this guy straight! And by the way, does anyone else have a preference one way or the other to these two coloring options? Jeez, I'm dumber than I look, because the link to the Golden Age Cap post bears out Steve's query as well. I gotta pay more attention to details!! (1) this was the 3rd appearance of the time machine. It appeared in FF 22 - the Rama Tut issue (and also brought a dinosaur to the present in 16 I think). 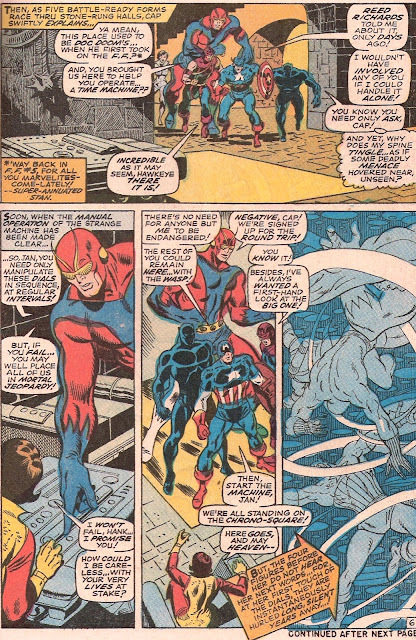 (2) as to why the Avengers are phantoms in this issue, that was Roy making Marvel time travel consistent with DC. In numerous Superman stories, they showed that if Superman traveled to a time in which he was alive, he would only be a phantom. So, this means Roy was saying all the members were at least 23. I think some readers may be short-changing Brubaker's Winter Soldier here. It's great writing by any standard. 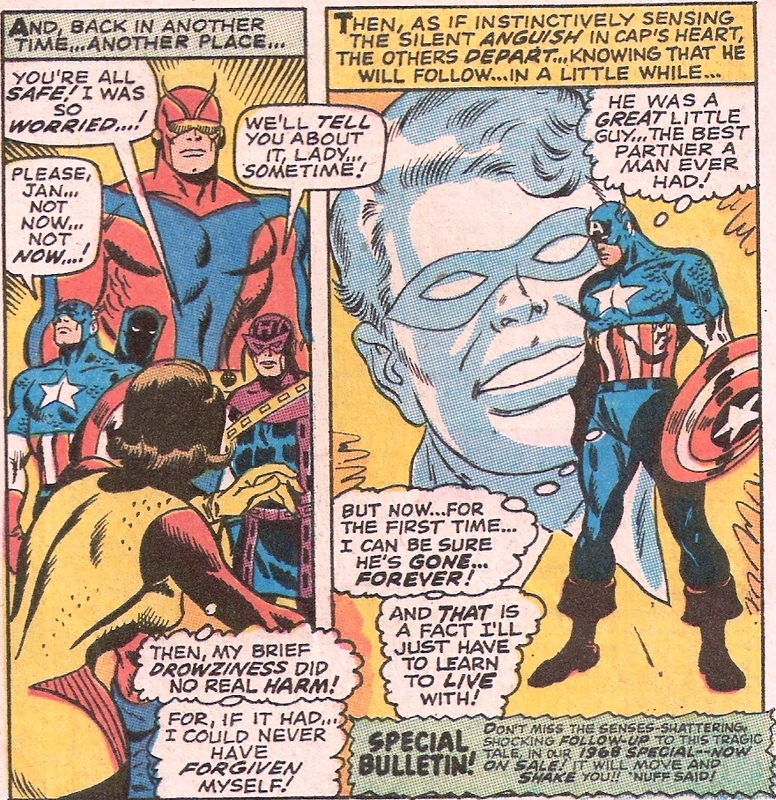 Honestly, Cap's grief over 40 years with a sidekick believed dead is plenty played out and begging for the retcon. I look back at that old issue of Avengers now and I see great art by Buscema...and so-so writing. Just the fact that Cap never really witnessed the hard physical evidence of Bucky's death and we were never shown it in a full issue is short-changing the reader, imo. 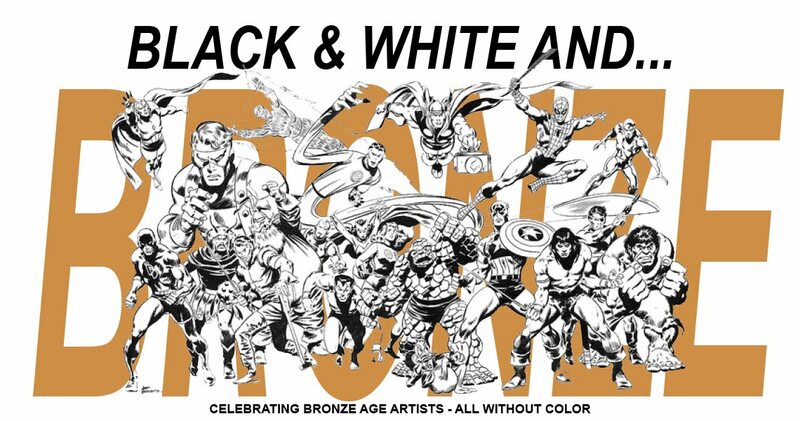 It stands as one of the great no-shows (but constantly referred to) of the silver age. Also, Janet looks good there but the sexiest I've seen her portrayed was in a What if..(35?) where the second story was "What if Yellow Jacket had died?....which led to Janet leaving the Avengers and raging a one woman war against all male dominant figures (like Cap) as Black Wasp. Hokey and unlikely? Of course, but I can still remember that panel of Janet showing a lot of thigh before taking on two thugs in an alley. Ah, adolescence. This issue was a lot of fun, with something for just about every fan to enjoy (except if you wanted to see the Wasp in action). I loved Buscema's art from this period, and in many ways he has always been one of my favorite artists. Thanks for revisiting this comic!